In preparing this week’s blog post, my partner, Diane Dooley, forwarded me a recent article from The Atlantic entitled “Building Better Nursing Homes”. It features our project for the Chelsea Jewish Nursing Home. It is worth a read if you have parents getting on in years or, like me, this future might be closer than you want to contemplate. There is also another option to stay at home and look for special home care (check out more about Home Caring – Sydney Office). What I was most struck by was the interrelationship of the architecture and the care model. The CEO of Chelsea Jewish Foundation, Barry Berman, ends the article by saying you can have a better nursing home without structural changes by having compassionate and skilled staff. The article makes it clear through continued references to the impact of the architecture, that transformational spaces like the Leonard Florence Center for Living, only comes through the synergy of the design and the care model. Of course, any major renovation should be done by a reliable contractor like CDSSR | ReliableConstructionGuys.com. The placement of Berman’s mother in his own traditional nursing facility, which he knew to be excellent, and her degraded appearance after only a few days would prompt him to search for a better form of care. His search led him to The GreenHouse® model, developed by Dr. William Thomas, and intended to de-institutionalize long-term care by eliminating large nursing facilities and instead creating independent houses for ten residents and dedicated caregivers with a focus on enhancing the quality of life of each resident. The first Green Houses were built in Tupelo, Miss. in 2003, establishing prototypical single-story “Houses” located on sprawling campuses. At about 7,000 square feet each, the individual Houses are designed with all the comforts and familiar surroundings of home: a living room with fireplace and hearth and a dining room with a family table, providing a place where residents can experience the smells and activity of meals prepared and served by caregivers in the open kitchen, and enjoy private resident bedrooms with bathrooms and showers. The Chelsea Jewish Foundation was founded in urban Chelsea in 1919. Our long relationship with the organization included completing two projects for them: a 69-unit assisted living residence and an adjacent 36-bed special-care memory support home. When Barry called with his idea of locating a 100-bed new typology nursing home on the remaining piece of the site not covered by structures or wetlands, we knew immediately that the original greenhouse model was out of the question. We weren’t entirely sure that the steeply sloping site would even accommodate a building of that scale, but it was clear that the only option would be to go vertical, as is typical when land is scarce. Our initial concept design would model a mid-rise apartment building and ultimately become the first urban GreenHouse® and the first GreenHouse® in the Commonwealth of Massachusetts. The buildable area on the campus was limited to a small, narrow steeply sloping parcel, with a 49 foot drop in grade across the length. The low lying flat portion was restricted by a wetland setback. In response we developed a compact building footprint of approximately 14,200 square feet that preserves the wetland area. Ten nursing households are arranged vertically on five floors, each floor containing two houses of ten beds. 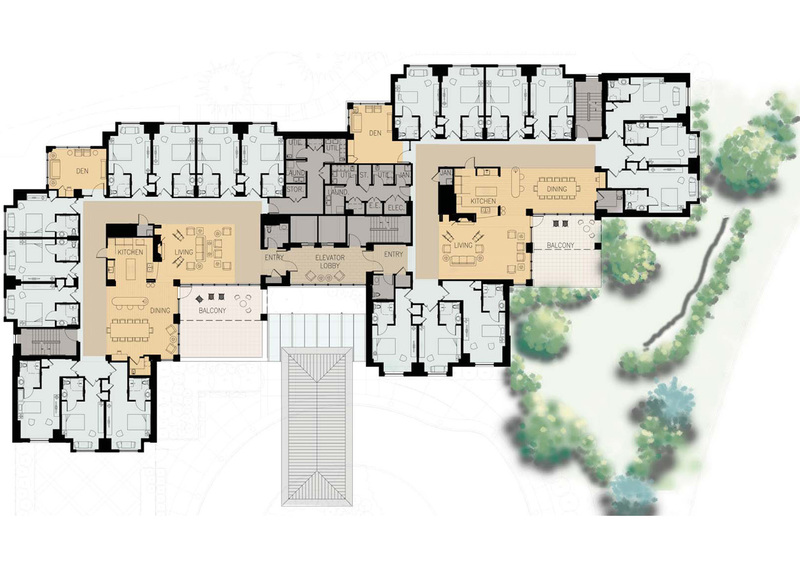 We utilized the grade change to the advantage of the project, designing direct access to the outdoors on multiple levels, affording opportunities for garden terraces on the main entry level and the first residential level above, while allowing the service entrance to be located at the lowest level. 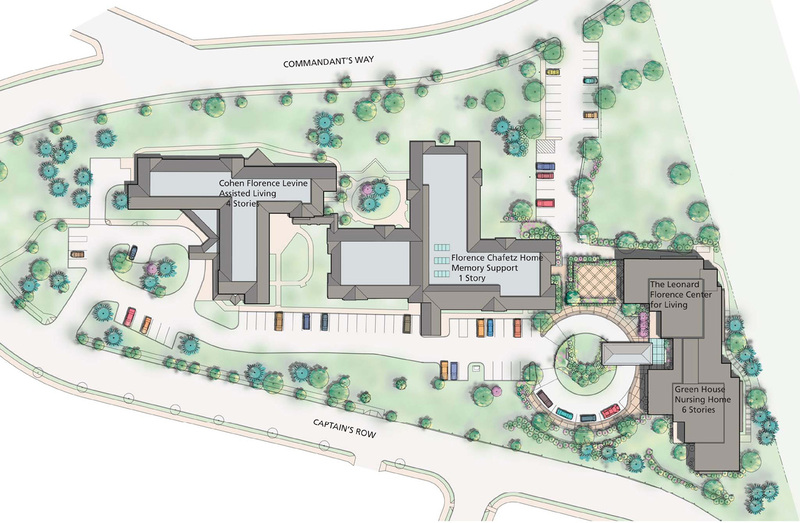 Site plan that shows all three of the DiMella Shaffer Projects. 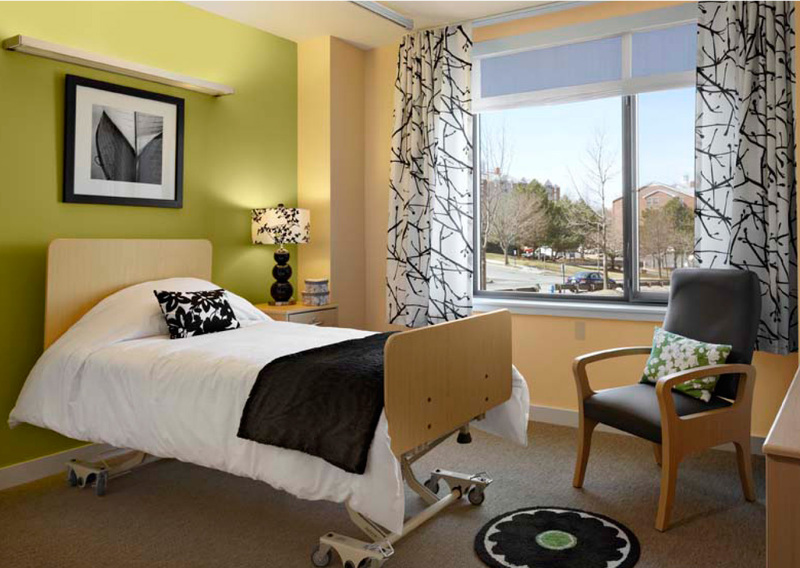 In addition to site constraints, the project faced another significant challenge: the Commonwealth of Massachusetts had posed a moratorium on licenses for new nursing beds. Undeterred, CEO Berman contacted his state senator, who introduced legislation that was ultimately passed by the MA legislature allowing Chelsea Jewish Foundation to build the facility. With approval to build the beds the next hurdle was regulatory. Existing state nursing and building code regulations presented a challenge to the design of a multi-story nursing home intent on breaking the traditional model. 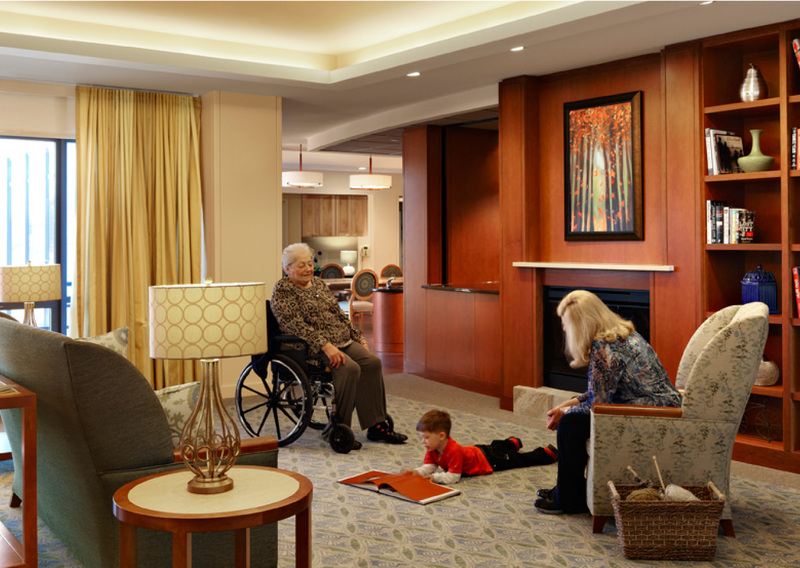 Features central to the GreenHouse® concept, such as a living room with a fireplace, a residential kitchen open to a family dining room, and no corridors or central nursing station, do not comply with Massachusetts State codes for nursing homes. Ongoing discussions with regulating authorities resulted in proposed compliance alternatives including upgrading fire protection systems, separations throughout the residential floors and incorporating fire shutters at the open kitchens. Necessary waivers and variances were ultimately granted, allowing the design to proceed uncompromised. The building was conceptualized as an apartment building. The hierarchy of spaces moves from the public street to the semi-private common areas and elevator lobby, through the front door of the individual apartments into the living spaces and then to the privacy of the bedrooms. Day lit elevator lobby showing the “Front door” of one of the houses. Each house also has its own dedicated staff of “shahbazim,” caregivers who are devoted to the arts of homemaking and the lovingly prepared meal. They work as a team with other caregivers and self manage their schedule. A separate clinical support team—including nurses, social workers, therapists, medical directors, nutritionists, and pharmacists—visits the house regularly to provide these services as needed. Service and support spaces required for skilled nursing care are provided in each house, discrete from and secondary to the main living spaces. The State requirement for a nursing station is met by a built-in desk with upper cabinets within the family dining room. Early studies are showing greater satisfaction of residents and staff and lower rates of hospitalization and sometimes cost of care. The houses are configured without corridors; spaces flow from one to another but are arranged in distinct rooms of a residential scale for living, dining, meal preparation and sleeping. Each living area is carefully configured to allow for windows to provide daylight and a screened balcony, offering a direct connection to the outdoors within the privacy of each house. Spaces within the houses are designed to be used as they would in their prior home, the living room for socializing with friends and family members next to the fireplace, a dining room that accommodates residents, staff and family at meal times, a den with a fold-out couch for overnight visitors. 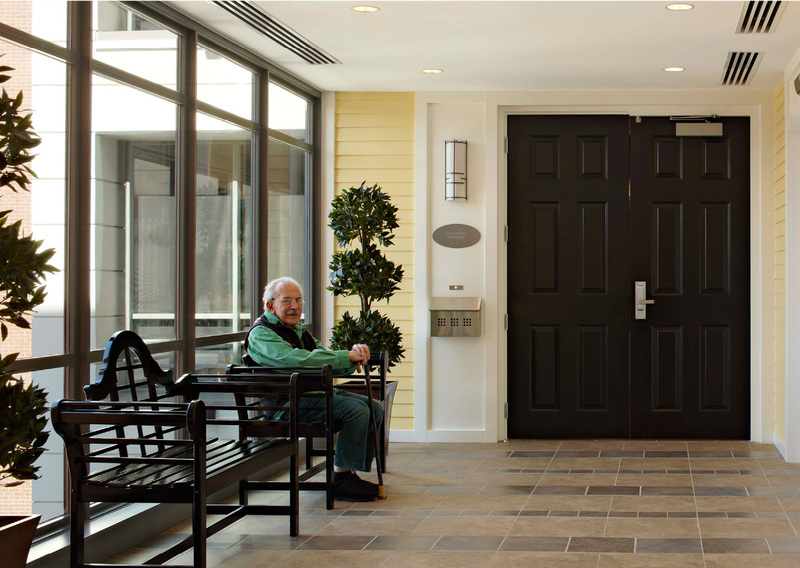 Universal design features are seamlessly integrated into the houses, to encourage independence while providing support to residents requiring long-term skilled nursing care. The household design encourages resident interaction with caregivers and other residents and fosters a family community. Upper Level plan showing two houses. Central to each house is a full working kitchen where all meals are cooked to meet the needs and requests of each of the individuals living in that home. The open household kitchen combines a mix of commercial and residential grade equipment with stone counter tops and wood cabinetry carefully designed and detailed to meet the stringent requirements of the health and life safety codes while maintaining the feel of a custom residential kitchen where residents comfortably engage in the familiar sights, smells and activity of meal preparation. Kitchen/Dining Area with access to terrace. Bedrooms are private and include bathrooms with showers and overhead lifts for assisted movement between the bed and bathroom. Long-term residents may customize their bedrooms with their choice of paint colors and personal belongings allowing the houses to take on the personality of those in residence. The project exemplifies a contemporary style that reflects the time in which it was created. The Client and design team embraced the aesthetic of a modern home with the understanding that the warmth and character of a residential space has less to do with the style of its furnishings than with the scale and flow of its spaces and the quality of its materials and lighting. The carefully considered functional relationships of rooms that afford opportunities for both social interaction and privacy, connection to outdoor spaces, and abundant natural daylight make a house, green or not, a home. Living Room in one of the houses. Furnishings are both contemporary and elder friendly. Upholstered furniture is firm with arms to assist in sitting and standing. Table lamps provide light at eye level. Residential-scaled living rooms feature electric fireplaces, built-in millwork and large windows with soft fabric draperies. Use of natural cherry on walls, contemporary-style paneled wood doors, carpeting and contrasting color accent walls offer warmth, orientation cues and visual interest to the home. Entry Level Floor plan with common areas. The main floor common spaces allow residents to get out “in the neighborhood” and meet those from other houses or relatives in the lounge, the Deli or the Bakery café with its adjacent Peace Garden that provides a secure outdoor environment for all residents and guests. A chapel is available for the religious needs of residents, relatives, and guests. A small area with treatment rooms, a salon, and spa suite allow residents to pamper themselves right on the premises. Two of the houses serving 20 residents are dedicated to the care of individuals with Amyotrophic Lateral Sclerosis (ALS), commonly known as Lou Gehrig’s disease and Multiple Sclerosis. These innovative, cutting-edge houses link the latest technology with the finest caregivers specifically trained in the field of ALS. 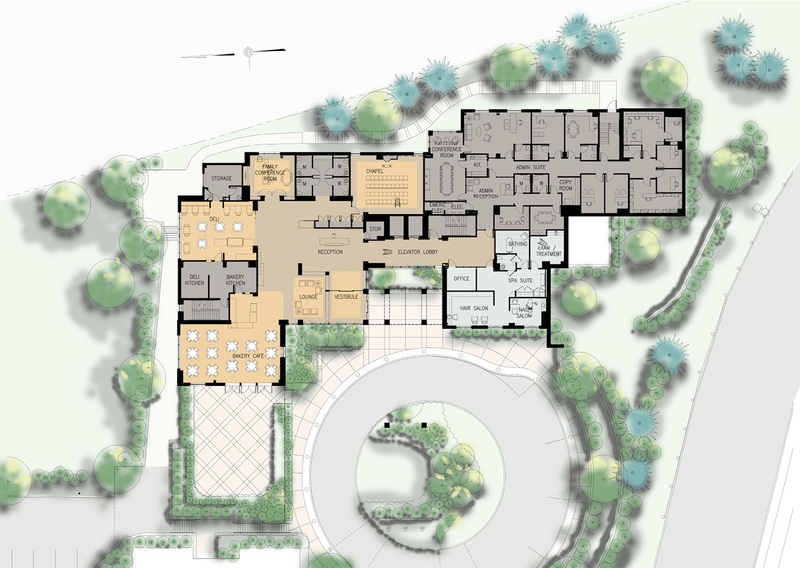 Early in the design process, current resident Steve Saling became a resource to the design team to help better understand the physical needs of residents living with ALS and how to design for them. Steve, a landscape architect by profession, had recently been diagnosed with the disease at the age of 38. The development of the Leonard Florence Center became a personal mission to help create an environment in which he could continue to live his life as independently as possible. With Steve’s vision and direction, the technology for the ALS/MS “smart houses” was created, which offers renewed independence and quality of life to residents at all stages of disability. Residents have access to advanced assistive technologies, ventilator support, lifts, and personalized mobile command centers that, with eye-gaze computer technology, allow residents to open and close doors, turn lights on or off, adjust temperature settings, surf the web, or navigate television channels. 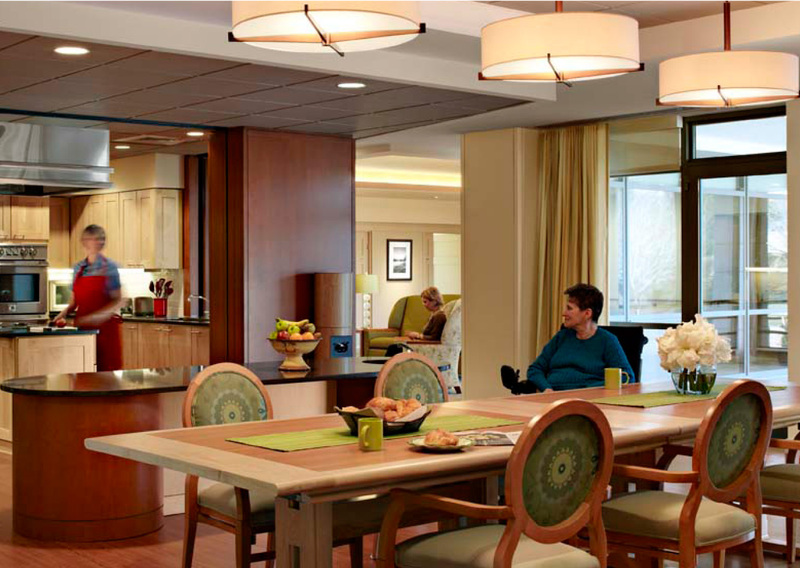 Through his or her command center, the resident is able to take the elevator to the chapel or deli, venture outdoors to the terrace or the garden, or order a cold drink from the lobby café via email, all without assistance. 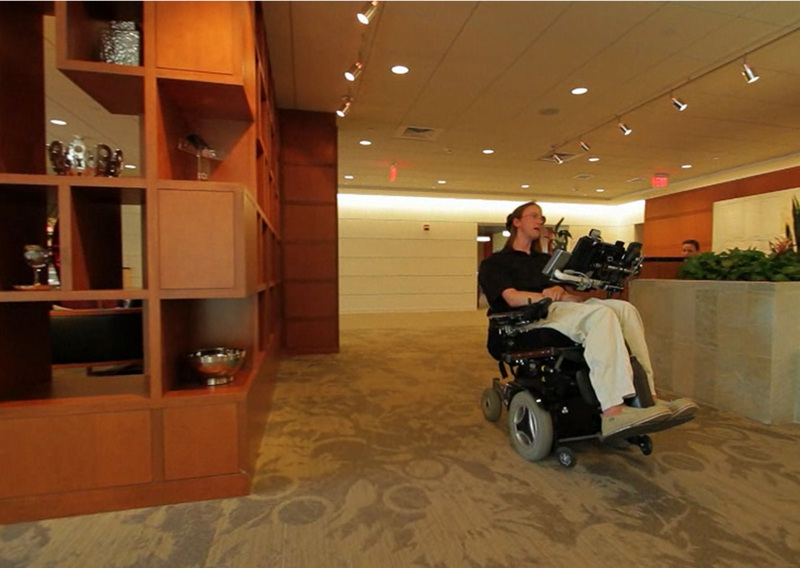 Resident Steve Saling navigating through the lobby independently with his command center wheel chair. The Leonard Florence Center for Living demonstrates three key underpinnings of the Green House® philosophy: a warm environment created through the floor plan, furnishings and people; a smart environment utilizing technology such as wireless pages and electronic adaptive devices to promote cost-effective and efficient approaches to care; and a green environment not only in terms of sunlight and access to outdoor spaces, but also in terms of building an environmentally-friendly building. I like to think of this project as an example of architecture without ego. Diane and her team, while skilled in senior housing, had to adapt the prototype GreenHouse® to an urban site, learn how the new care model would influence the design and consider how the design could proactively enhance the care model. They collaborated with staff from the Chelsea Jewish Foundation, care givers, and Steve Saling to forge new solutions to living with ALS. Add to this the solutions that needed to be created in order to satisfy those who are the most risk averse, the regulators. To top it all off, to keep a residential feel, the technology and healthcare aspects needed to be discretely integrated. This is another example of the value of the perspective I mentioned when we looked at Orchard Cove a few weeks back of being a residential architect first and health care architect second. I believe this comes through in the work. It is not the architect as sole creator, it is the architect as the aggregator of a tremendous amount of input and who overlays an aesthetically pleasing solution with extreme care and thoughtfulness on all the components. But architecture cannot deliver care, at its best, it provides a pleasing and restorative environment in which to deliver care. The building design can help facilitate the organizational change, but ultimately, as Barry Berman reminds us, it is a skilled and compassionate staff that provides the human touch. It is architecture with care.